The intention to receive is called the “evil inclination”; whereas, the intention to give is called the “good inclination.” The action per se remains the same. We can differentiate between good or bad actions only by intentions that stand behind them. Thus, a process of correction is in fact a modification of intentions. If it is self-oriented, then it is considered to be the evil inclination; if it is focused on our neighbors, then it is good. 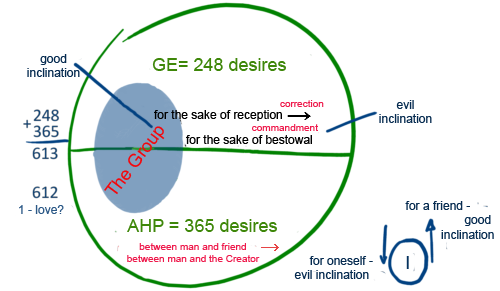 Eventually we have to correct 248 and 365 desires; all together they comprise 613. However, in reality we only correct 612 desires, since the last commandment (the one about love) remains “problematic.” As Kabbalists say, by improving 612 desires, we will attain love. In other words, from love of friends we come to love the Creator. In the overall system, there is a special part of desires, of course interconnected with the rest of desires, the group that must correct itself. I am not there at the beginning. But as soon as I start working with the group, with friends, wanting to connect with them, and doing so in reality, I will find that in my nature everything is against this: “I cannot, I am not able, I don’t want to, I will not do this.” This is what the evil inclination is, that I do not want to unite, and it hinders me. Then I call it my “hater” and demand correction from the friends, who are near and far, from anywhere. I discover where correction is, how to realize it, how to overcome my inclination. And I do so until I feel the need to turn to the Creator. It will not happen immediately. I can scream now, but then the egoistic desire grows, and the thought of the Creator becomes unbearable. I hate Him, I am ready to destroy Him, anything but not to turn to Him. I think that I am required to do the impossible, as if instead of destroying the enemy, I have to love him and help him. It is very hard. And then, feeling hopeless, desiring to achieve bestowal in spite of everything, I turn to the Creator.